The series focuses on Monkey D. Luffy, a young man inspired by his childhood idol and powerful pirate "Red Haired" Shanks, sets off on a journey from the East Blue sea to find the One Piece and proclaim himself as the King of the Pirates. In an effort to organize his own crew, the Straw Hat Pirates (麦わら海賊団篇 Mugiwara Kaizoku-dan? ), Luffy rescues and befriends a swordsman named Roronoa Zoro, and they head off in search of the One Piece. They are joined by Nami, a navigator and thief; Usopp, a sniper and a liar; and Vinsmoke Sanji, a womanizing chef; in their journey, they acquire a ship named the Going Merry and engage in confrontations with notorious pirates of the East Blue. 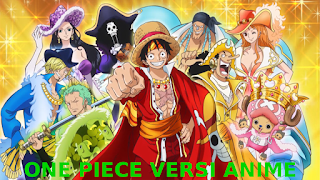 As Luffy and his crew set out on their adventures, others join the crew later in the series, such as the doctor and anthropomorphized reindeer Tony Tony Chopper, an archaeologist formerly employed Baroque Works agent Nico Robin, and musician skeleton Brook.